The US is considering bombing pipelines in Syria, which it claims is in an attempt to cut off the huge profits being made by ISIS from captured oilfields. The Independent quotes Julieta Valls Noyes, the deputy assistant secretary for European and Eurasian Affairs during a visit to London, that ISIS was making $2 million a day off oil sales and that the US would consider airstrikes as well as “kinetic strikes against some pipelines” and “actual physical action to stop the flow”. The trouble with this justification for destroying Syria’s oil pipelines, is that ISIS does not have the capability to use the pipelines to transfer oil. ISIS transports the stolen oil on the back of trucks, and sells it on the black market in Turkey. This is admitted in the same Independent article that quoted Ms. Noyes. Isis has sold some of the fuel from seized facilities back to the Damascus regime through local deals, while shipments had been sent into Turkey for the black market, with the Erdogan government accused of turning a blind eye to the illicit transactions. If the US truly intended to stop ISIS oil profits, they would bomb these oil convoys, which are easily spotted via conventional surveillance flights already allegedly taking place as part of ongoing Western operations. The US agenda behind destroying Syria’s pipelines has very little to do with ISIS oil profits, and far more to do with destroying Syria’s oil infrastructure.In fact, the statistic that ISIS is making 2 million dollars a day from the sale of crude oil is an estimate from a single consulting company (IHS) based in Colorado in the United States. The US administration is choosing to quote this as if it were without a shred of doubt. It’s far more likely that the scale of the profits has been overblown to deflect from the fact that ISIS is receiving funding from state actors such as Turkey, Qatar and other Persian Gulf states, while at the same time providing an excuse to target Syrian infrastructure. Earlier last month the US-led airstrikes on Syria and Iraq supposedly destroyed small oil refineries in Raqqa. No effort was made to prove whether or not ISIS was in fact capable of using Syria’s oil refineries. In fact the same consulting company which the US administration is quoting about ISIS oil profits (IHS), states that ISIS is selling unrefined crude oil. The IHS adds the caveat that this estimate was made before ‘US airstrikes’ eluding to the notion that US airstrikes have had an effect on ISIS oil profits. However, the Britain based pro-insurgency Syrian Observatory for Human Rights, which was the West establishment-run media’s most reliable source years into the Syrian crisis, said that the oil refineries were not real targets and were not being used by ISIS. These so-called refineries are not a real target and they do not weaken the Islamic State as they do not have any financial value for them,” Rami Abdel Rahman of the Observatory told Reuters. “They are composed of trucks with equipment to separate diesel and petrol used by civilians. Syria’s two main oil refineries are known to be in Homs and Banyas, not anywhere near Raqqa. The US Declaration that they are destroying ISIS makeshift refineries, is all smoke and mirrors, and will probably be used as a justification to destroy more of Syria’s infrastructure in future. The destruction of Syria’s oil infrastructure would also open the door for US and UK oil companies to win contracts to rebuild it, paid for in debt, by the Syrian state. Foreign companies running Syria’s oil and gas production would prevent Syria from nationalising their own resources and becoming an independent prosperous country. This would result in the basic enslavement of the country while mitigating the threat it poses to US client states including Israel, Saudi Arabia and Turkey. 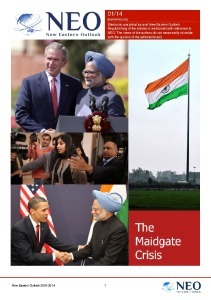 There is more to the US objectives than profiting off of Syria’s oil. The US also seeks to control the flow of oil and its sale to other nations, which is a far more important in achieving global hegemony. Their objective may also have more to do with Iran and Russia’s gas reserves than it does Syria’s oil. In 2009 … Assad refused to sign a proposed agreement with Qatar that would run a pipeline from the latter’s North field, contiguous with Iran’s South Pars field, through Saudi Arabia, Jordan, Syria and on to Turkey, with a view to supply European markets – albeit crucially bypassing Russia. Assad’s rationale was “to protect the interests of [his] Russian ally, which is Europe’s top supplier of natural gas. 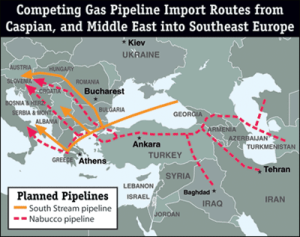 Instead, the following year, Assad pursued negotiations for an alternative $10 billion pipeline plan with Iran, across Iraq to Syria, that would also potentially allow Iran to supply gas to Europe from its South Pars field shared with Qatar. 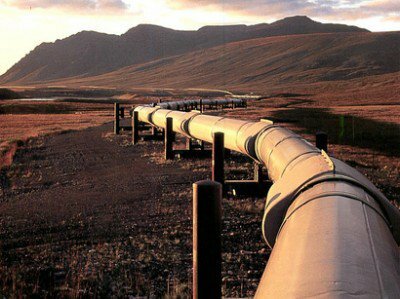 The Memorandum of Understanding (MoU) for the project was signed in July 2012 – just as Syria’s civil war was spreading to Damascus and Aleppo – and earlier this year Iraq signed a framework agreement for construction of the gas pipelines. The Iran-Iraq-Syria pipeline plan was a “direct slap in the face” to Qatar’s plans. 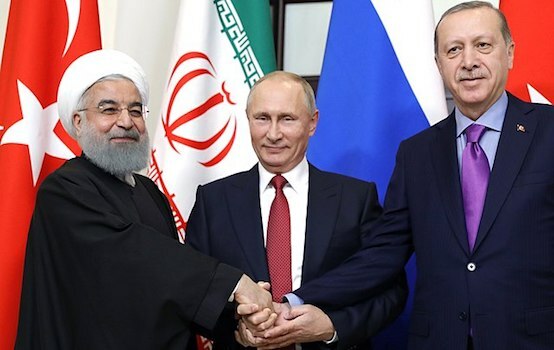 The planned Iran-Iraq-Syria Pipeline running through Syria’s coast and into the Mediterranean along which Russia has a presence, would allow Russian control over the tap and flow of Iran’s gas, mitigating rivalry between the countries. Qatar’s interest in funding the insurrection, was to overthrow Syria and install a pliable opposition that would sign Qatar’s pipeline agreement. Turkey, Saudi Arabia and Jordan also had a vested interest in this plan. This suited the US objective of undercutting and weakening Russian influence over Europe. However they also have an alternative plan for doing so. The planned Nabbaco Pipeline, running from Iran to Turkey to Europe, would directly set Iranian gas against Russian gas. Furthermore, in the absence of the successful overthrow of the Syrian government, the US has settled for destroying what it cannot control. Perpetual war and the destruction of pipelines would prevent or at least delay any possible pipeline agreement in future. With mainstream media headlines like “US bombing ISIS pipelines” it’s easy to forget that the Pipelines and refineries the US is planning to bomb do not belong to ISIS, but to the Syrian people.